Hunter always wears proper ear protection. Here he got behind an empty rifle on closed range. Here is a great “feel-good” family story from Forum Member Jonathan T. (aka “sniperjwt”). Father Jonathan explains how he introduced his son Hunter to precision shooting, at the ripe young age of six. Hunter took to shooting like a fish to water. 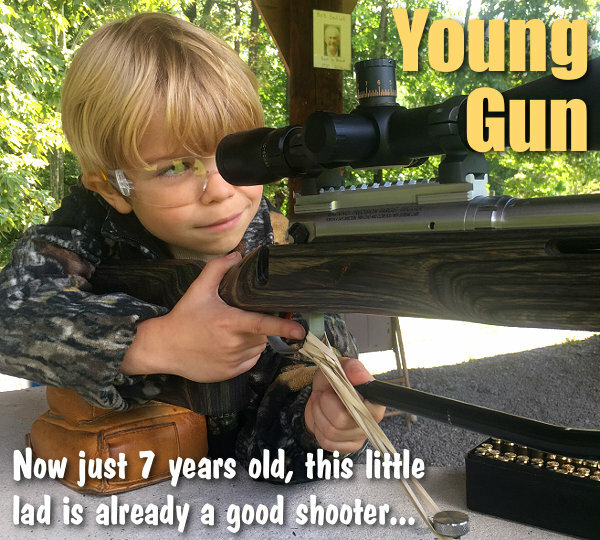 Now seven years old, Hunter is shooting half-MOA (or better) and hitting steel at 800 yards with ease. What’s more he even finished second in a St. Thomas, Pennsylvania Ground-Hog match — beating nearly all the ground-ups (including his Dad) in the process. You’ve got to watch this video — It’s priceless. This kid has talent. “Focus on your trigger… squeeze it easy”. If I’ve said it once I’ve said it 1000 times. Not because he isn’t listening, but just so he knows how important it is. 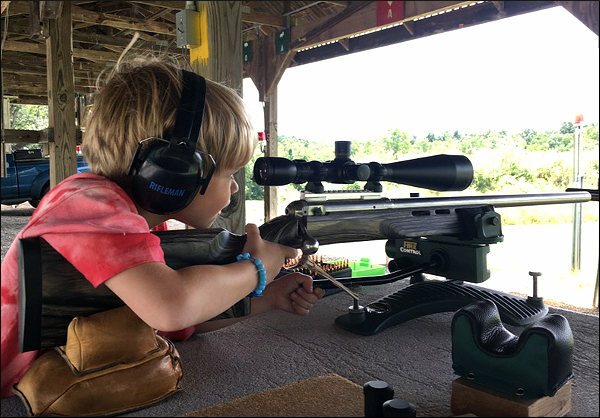 Last year, at the age of six, Hunter started showing a lot of interest in going with me to the local shooting range. Of course I was happy to let him tag along and see what it was all about. Most fathers hope that their son will pick up the same interest so they can share something that they both enjoy. 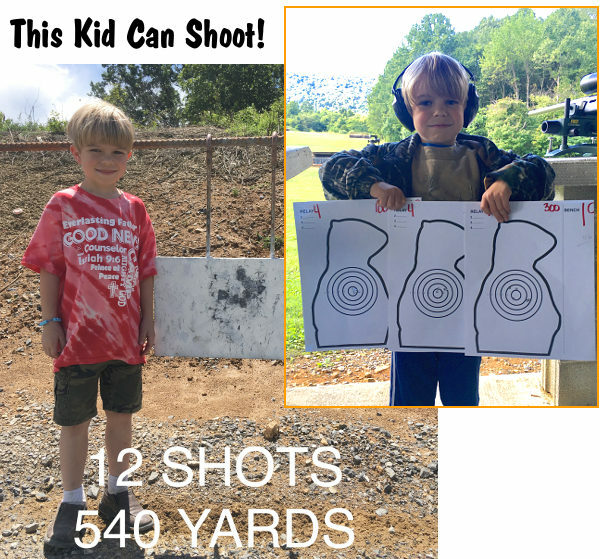 Teaching a kid to shoot can be very difficult, but also very rewarding. Hunter’s first really good group, shot at age 6. This is six shots at 100 yards with a Savage .223 Rem. After a couple range sessions, he wanted to shoot in one of the local groundhog matches I attend. I told him we would practice some more and if I thought he was ready we would go to the last match of the year in 2016. I ended up letting him shoot in that match, but he struggled a bit as it is a timed event. Overall he was happy with how he did and I was happy he enjoyed himself. Over the winter we continued to practice and he continued to improve each time we went out. In March he turned seven years old, but he is still a little guy weighing only 42 pounds. When this year’s 2017 matches started, he was very excited that I had told him he could go to all of them when he didn’t have baseball games. The first several matches he still struggled a little but he was getting better each time. Half way through the summer when we were at a match at Shippensburg Fish & Game, Hunter had an “AH-HA” moment. He was shooting at 320 yards and his first two sighters were good so I had him move over to the score side of the target. The first two shots were in the 9 Ring, but he jerked his third shot and it went over into the sighter side of the target. He did not know where it went and I just told him to get another one and shoot again. After he got his target back he looked at me and said “someone shot my target”. I asked him why he said that and he pointed to a bullet hole and said someone shot it right here. I explained to him that on his third shot where he jerked the trigger that is where it ended up. He looked at me and then the target and it was as if a light-bulb went off. Bingo — he finally understood why I kept telling him to focus on the trigger and squeeze it easy. After the match I let him shoot at 540 yards with the gun we mostly use in matches — a Savage Model 12 F-Class .223 Rem with a Sightron 10-50x60mm scope. Our “go to” load is Varget in Lapua brass with Berger 73gr bullet. He hit the plate just high of middle on the first shot and then commenced to put 12 shots within about a 4″ circle on the plate. After about shot 8 or 9 he asked if he could shoot at something else because he couldn’t even tell where he was hitting as the plate was splattered with hits. About a month later we were at the same range after a match and he wanted to shoot some more so I let him try his hand at 800 yards. At that distance there is a large 4’x4’ plate and he thought he was going to shoot at it but I told him I wanted him to shoot at a smaller 8″x11″ plate instead. I dialed in the elevation and told Hunter to get comfortable and “send it when he was ready”. He thought his first shot missed because he did not hear it immediately (as he would at shorter ranges). I told him that he did hit the target and to load another one. The next three were all hits. On his fifth shot I had him hold just off the left edge because a wind flag suggested it would be blown to the right. But that was not the case, so shot five was a miss. We corrected the hold and he put the last four rounds on the plate. 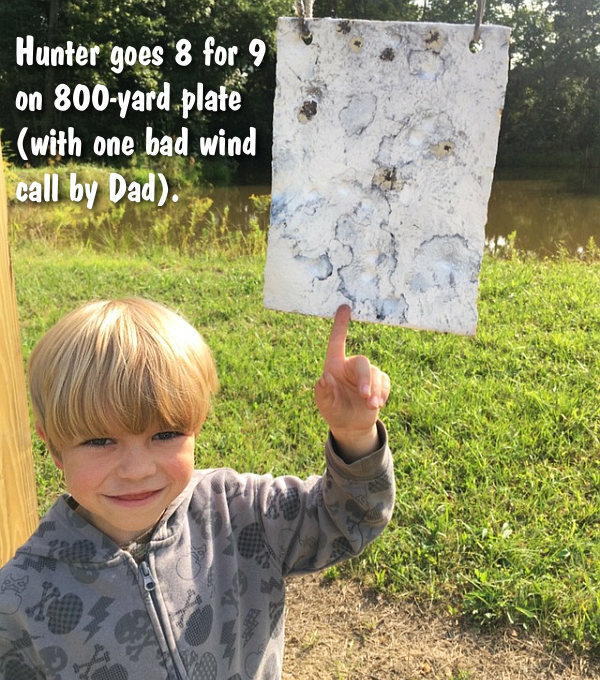 Hunter made 8 hits out of 9 shots on a 8″x11″ target at 800 yards! 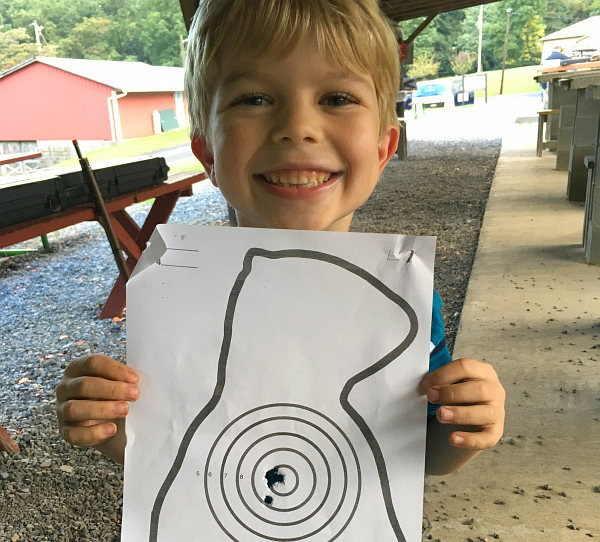 Not bad for a 7-year-old with a .223 Rem. Oh, and yes, the one miss was my bad wind call. The Groundhog match at St. Thomas is one of our favorite matches. Well, at this September match, Hunter would turn some heads for sure. At 100 yards he shot a perfect 100 with three Xs. 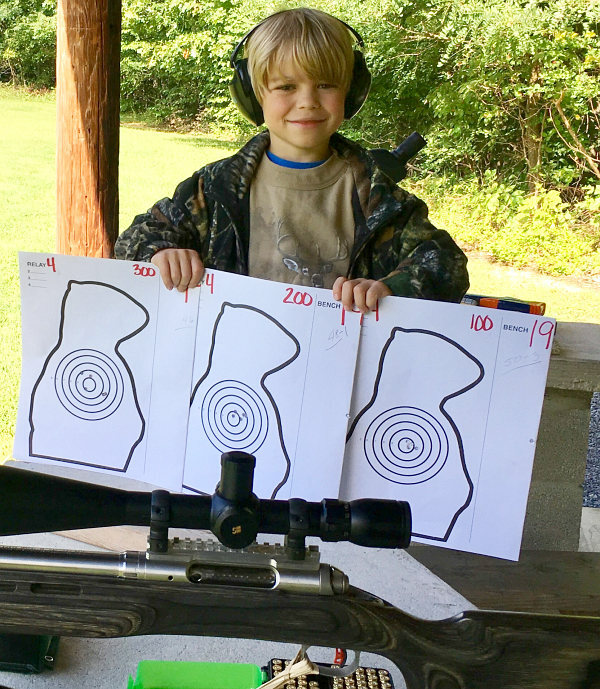 I told him after he shot the 100-yard relay that his trigger control was not real good and if he wanted to do good at 200 and 300 that he would have to do better. At 200 yards there was a night-and-day difference in his trigger control. It was as close to perfect as I have seen him do. He ended up with a 48-1X at 200. At this time we both had 98 scores but he had 4X and I had 5X. I was joking around with him before the 300-yard relay and he even had me text my wife and tell her we were tied. After I scored 44 in my 300-yard relay I told him, “Buddy, if you get a 45 or better you will beat me” his response was, “OK Dad, I’ll do that”. After some sighters, his first shot was a 10. I again told him that the trigger control was perfect and to do four more just like that. Hunter’s second shot was a 10. Now I got excited. His third shot was low and right in the 9 ring. Fourth shot was high and left in the 9 ring. Now I am shaking in excitement. Last shot was an 8 low and right cutting the hole of the third shot. I quickly did the math in my head and when he looked up at me I was grinning from ear to ear. I asked him if he knew what score he shot and he replied that he did not. I said a 46, and now he had a huge smile on his face. I let him come over to the spotting scope and look through it and when he got done I gave him a big hug and told him how proud of him I was. After the match was over I was called into the club office. Apparently a Junior Shooter had never finished this high and they were unsure how to handle awards since Juniors aren’t charged an entrance fee. I told them that I didn’t care how they handled it. I was just happy that he did as well as he did and he sure was happy that he beat Daddy. In fact Hunter’s score of 144-4X is the 4th highest score of the year in that class. To top things off this was the first time I had let him load his own cartridges from start to finish (under my supervision of course). As much as I enjoy Hunter’s interest in shooting, I love the fact that we have something we can spend quality time doing together. At the table after the match, Hunter was sitting next to a well-respected shooter everyone calls “Cowboy”. This gentleman leans over and says “Son, you don’t know how lucky you are, the only thing I did with my dad was work in the garden”. My hope is that one day he will know how lucky he is… Right now I know how lucky I am to be able to spend time with my son doing something we both enjoy. 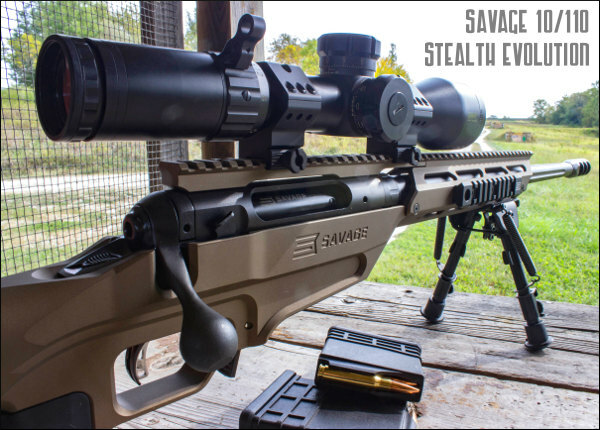 Share the post "Young Gun — Hunter the Talented 7-Year-Old Trigger Puller"
Savage has just introduced the new 10/110 Stealth Evolution Chassis Rifle in six chamberings, including the PRS-pleasing 6mm Creedmoor and 6.5 Creedmoor. This rifle will be offered in right-hand and left-hand models. Big Boomer fans can order a .300 Winchester Magnum or the .338 Lapua Magnum. The 10/110 Stealth Evolution pairs a heavy fluted 5R barrel with a monolithic aluminum chassis finished in bronze Cerakote. The hard polymer-ceramic coating resists abrasion, corrosion, and impact damage. The rifle features a factory-blueprinted 10/110 action, matched with user-adjustable AccuTrigger. The Stealth Evolution comes standard with an extra-long top rail and factory muzzle brake. MSRP for standard calibers is $1799.00 (.300 Win Mag $1999.00 MSRP; .338 Lapua Magnum $2149.00 MSRP). 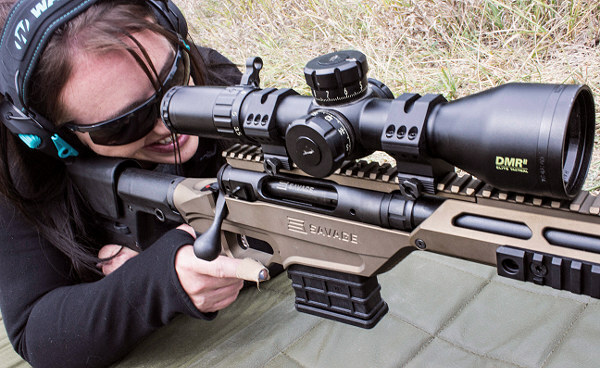 AccurateShooter Comment: We like the availability of the 6mm Creedmoor chambering, which is finding favor among many PRS shooters. The 6mm CM has less recoil and a flatter trajectory — plus 6mm bullets are cheaper. Savage did the 6mm version right. At 26″, the barrel is long enough, and the 1:7.5″ twist can stabilize the new 110gr SMKs. 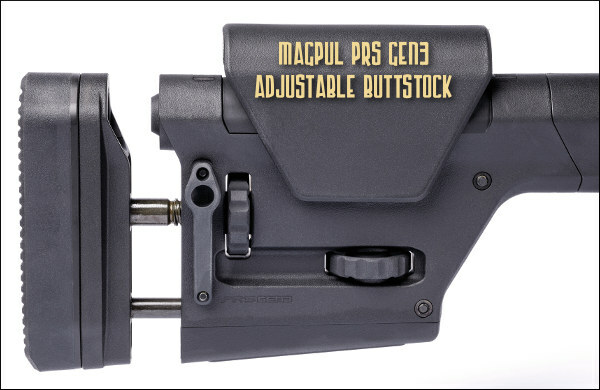 That Magpul PRS GEN3 stock looks good — controls are tucked away and the toe can be used with a sand-bag. Some other tactical stocks have rails and/or other “pointy bits” that snag on a rear bag. In .223 Rem or 6mm Creedmoor, this rifle would be a good choice for Prairie Dog safaris. We do wish Savage offered a front sled for bag use though. 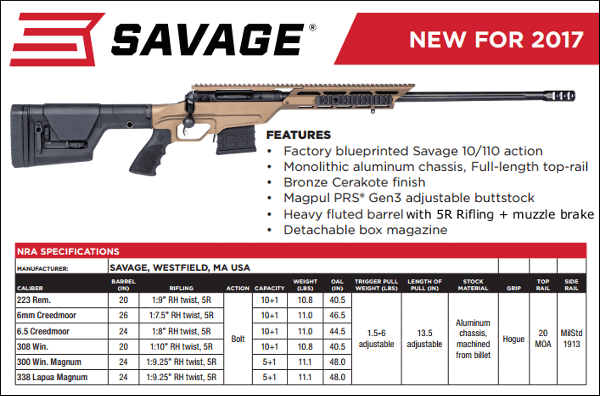 Share the post "New Savage 10/110 Tactical Rifle with Modular Chassis"
Todd Jarrett is one of the world’s best handgun shooters. A multi-time World Champion, Todd knows a thing or two about semi-auto pistols, particularly 1911s and 1911-based raceguns. 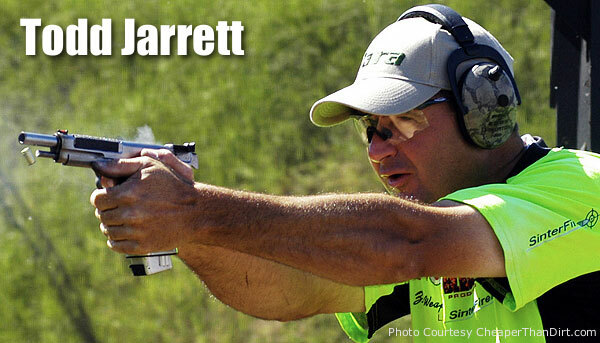 Jarrett holds four World titles, nine National titles and has won more than 50 Area championships, as well as many other action shooting events. Jarrett is the only USPSA Triple Crown Winner and he holds four USPSA National titles: Open, Limited, Production, and Limited-10. Jarrett revealed in an interview that between 1988 and 2001 he shot about 1.7 million rounds during practice: “I had a gun in my hand for two hours every day for 10 years to develop my skill level”. In the video below, Todd explains how to get the proper grip on your handgun, and how to employ a proper stance. We’ve watched many videos on pistol shooting. This is one of the best instructional videos we’ve seen. Todd explains, in easy-to-understand terms, the key elements of grip and stance. One very important point he demonstrates is how to align the grip in your hand so that the gun points naturally — something very important when rapid aiming is required. If you watch this video, you’ll learn valuable lessons — whether you shoot competitively or just want to have better control and accuracy when using your handgun defensively. “Shooting semiautomatic pistols using the thumbs-forward method really becomes useful … where speed and accuracy are both needed. By positioning the thumbs-forward along the slide (or slightly off of the slide) you are in essence creating a second sighting device: wherever your shooting thumb is pointing is where the pistol is pointing. This makes it incredibly fast to draw the pistol, get your proper grip, and press forward to the target without needing to hunt around for the front sight.” — Cheaper Than Dirt Blog, 9/13/2010. Share the post "How to Hold a 1911 Correctly — Tips from Todd Jarrett"